Anyone who grew up in the ’90s almost definitely has some happy memories of watching the movie Babe over and over again. The movie about the kindhearted pig that becomes a prize-winning sheep herder came out in 1995, and it’s an important part of the childhoods of people all over the world. 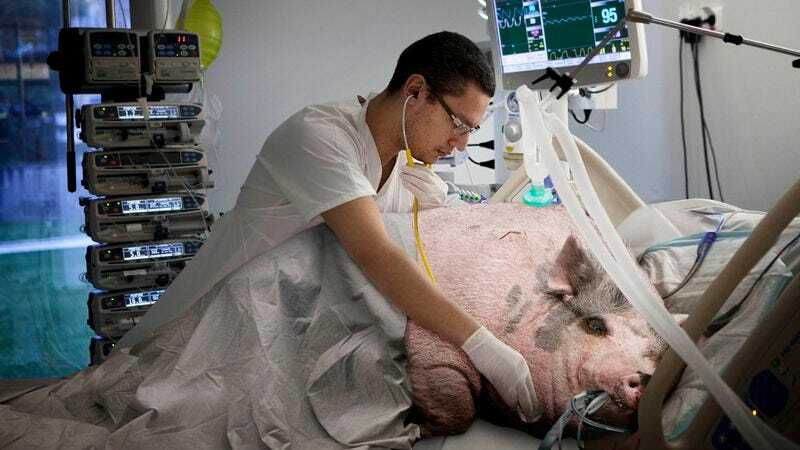 That’s why, when Tugboat, the pig that played Babe in the film, began showing signs of age and declining health in 1997, this amazing team of doctors at the Johns Hopkins Hospital in Maryland immediately came to his rescue by hooking him up to intensive life support. Eighteen years later, thanks to their efforts, the pig from Babe is still with us! The heroic doctors in charge of keeping this important part of our childhoods alive have achieved truly miraculous results. While the average pig’s lifespan is only eight years, Tugboat has now been with us for more than two decades, and medical experts suspect they will be able to keep him alive for at least another 30 years! Awesome. Dr. Samuelson and his colleagues perpetuate Tugboat’s sedentary existence through an aggressive medical regimen, which includes extensive surgeries, dialysis procedures, catheters, and intravenous feedings. His body must be dosed with a steady stream of amphetamines because doctors are afraid that if he dozes off, his brain activity will shut down completely and he will not be able to regain consciousness, which means that everyone’s favorite pig has now been awake for nearly 20 years. Wow. The work that these medical heroes are doing is truly inspiring. We’re looking forward to enjoying our time with Babe for as long as possible.